Is it possible to live on one income and invest the rest of your money? It requires diligence and discipline but yes, your family can live on one income and invest the rest of your income! Couples who choose to live on one income instead of two actually have plenty of choices for what they want to accomplish with that other income. Saving for the future and paying off debt are two of the top options on most peoples’ list. If you’re bringing in two incomes and living off of one, a wise option to throw into the mix for that second income is to invest it if you can. Investing is one of the most common ways to build wealth by creating a sustainable nest egg for you and your family. 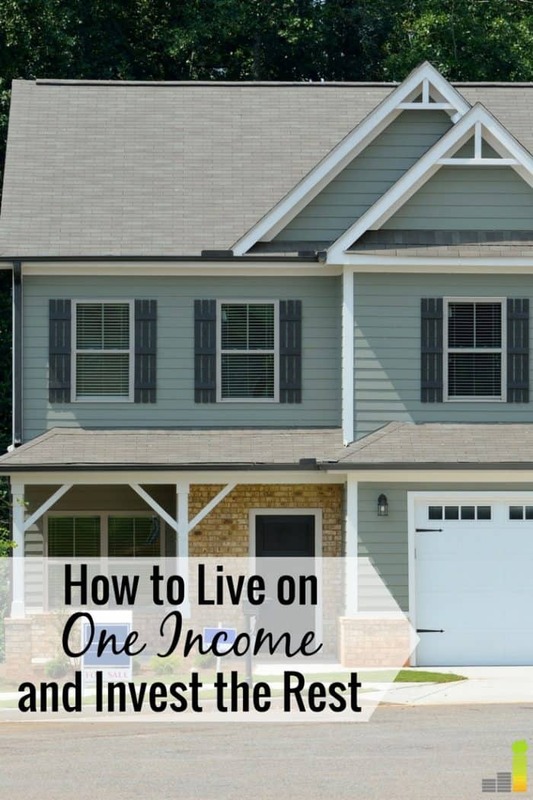 If you have a two-income household, see if you can lower your expenses and deflate your lifestyle so your family can learn how to live frugally on one income. Then, use other income to beef up your savings (here are four simple ways to boost your savings each day), pay down debt and invest. 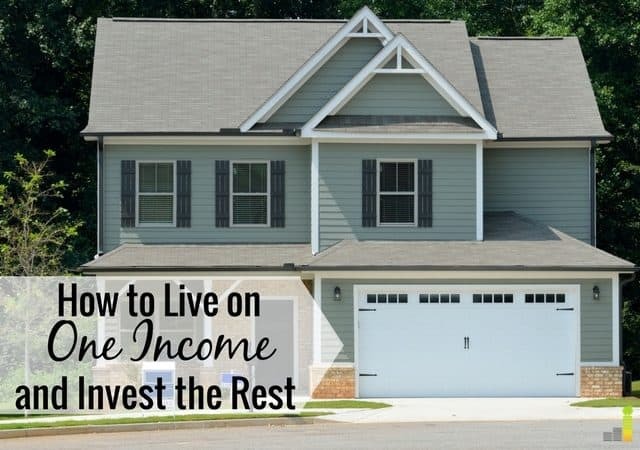 Here are two ways you can invest your second income now and two reasons why you should. Maxing out your retirement fund each year is not always an easy feat thanks to generous maximum contribution levels, but it’s absolutely worth shooting for. The current maximum in 2017 for a 401(k) and 403(b) is $18,000 while the maximum contribution for a Traditional and Roth IRA is $5,500. Investing $20,000+ per year may sound like a lot of money but if you’re not relying on that income to survive, it makes it a lot easier to part with. Plus, the tax breaks will be nice and setting up automatic contributions will make your efforts seem out of sight, out of mind, but you’ll still be making progress toward your goal. Just make sure to watch your fees to invest so more of your money works for you. If you’re a DIY investor, you can open an account with Ally Invest and trade for as little as $3.95 per trade – the lowest in the industry. Being able to save 50 percent of your salary each year can open up so many options for you like having the ability to create passive income quicker. Aside from saving for retirement, you can have more freedom to invest in a side business or generate extra streams of income through real estate. If you’re interested in real estate investing, you can start with as little as $5,000 in a free RealtyShares account. You get to select from thousands of residences and it can be a great way to start building passive income. This is what my husband and I hope to do since we set a goal to purchase our own investment property within the next five years. Our plan is to have a tenant pay off the mortgage over a 10-year period, then we can funnel cash to fund college expenses for our son. After that, the income the property creates will be as good as ours. You can also invest in continuing education that will help you build passive income or even peer-to-peer lending through Lending Club if you want to start on a smaller scale. Building passive income takes time and everyone wants to get to the end result ASAP. When you commit to living on one income and investing the other, you’ll have a better opportunity to earn passive income faster. As a result of being able to potentially max out your retirement accounts easier and build passive income quicker, you’ll be able to reach financial independence earlier than most if that’s your goal. Some are more into the FIRE (Financial Independence Retire Early) movement than others and that’s fine. I’m one of those people who can’t really see myself working as hard as I do now in my 50s and 60s while on the other hand, my husband’s grandmother worked into her 90s spending seven days a week managing a business she loved. However, regardless of what anyone says, I’m not sure you can argue much with the idea of having enough assets lined up that you can do whatever you want with your time. If you love your job, you can keep working but if an amazing opportunity to go live in Sydney, Australia for two months pops up, you can do that too without having to worry about money. An important thing to keep in mind when it comes to achieving your financial goals is to track your finances. Tools like Personal Capital let you track your spending and monitor your bank and investing accounts to make sure you’re on the path you want. There is no right or wrong goal and no one really knows what the future will actually hold, but if you’re interested in having extreme flexibility, learning how to live on one income and investing the other partner’s entire salary year after year will help you get to financial independence sooner than you think. If you raised an eyebrow at the thought of investing so aggressively, you’re not alone. However, after debunking several investing myths, it’s clear that the market has always recovered in the past. So, if you’re looking for another reason to invest your second income, the historical strength of the stock market provides a good one. You just have to remember that accomplishing your investing goals requires riding out the daily ups and downs of the markets. If anything were to happen during your investing journey, your family would survive just fine because you’ve already established a comfortable lifestyle that only lives on one income. This is great security as well if you and your partner ever lost your income and it took you a while to replace it. The challenge is to explore your options and see what’s possible based on your needs and goals. If you and your partner both prioritize investing, teaming up will help you reach your financial goals faster. If you can make lifestyle changes that enable you to invest one person’s salary, that’s great. Try it out for a year or do it as long as you please, but take some time now to consider the value of investing some or all of one of your incomes, as you’ll be doing your future self a big favor. Do you and your partner save half of your income? What things would you have to give up to make that possible? What’s one opportunity you’d like to take advantage of if you were financially independent? How comfortable are you with investing? These are great tips! My husband and I both lived on our own incomes once we graduated school. So once we moved in together, we were able to save a significant amount of my income since we shared a lot of the living expenses we once had separate. It not only is allowing us to get ahead faster, but it makes our budgeting very easy! That’s good to hear. Most times, you can get ahead faster when you work together. I think most of this comes down to income. It’s easy to max out retirement accounts PLUS have extra money to invest in passive investments if you make enough. But if you’re making $30k a year, have student loans, have a kid, and that’s the only income for the entire family some things like maxing out a 401k is out of the question unless you increase your income outside of your 9-5. Income does play a role and that’s why 2 incomes can be more effective when it comes to reaching your goals especially if you can keep living expenses low. If your household only has one income, then you work with what you have of course.